Hull City's proposed name change to Hull Tigers has been rejected by the Football Association Council. The Council's decision - carried by a 63.5% vote of its members - followed the recommendation of the governing body's membership committee. 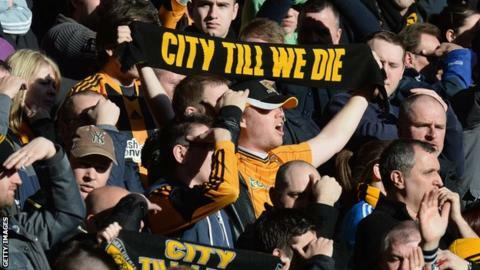 Fans' group City Till We Die said it was "delighted" with the decision. Formed in 1904, they first wore black and amber shirts for their maiden Football League campaign the following year. They moved to present ground, shared with Hull FC rugby league club, in 2002, after 56 years at Boothferry Park. Owner Assem Allam, 74, who has threatened to sell if he is not allowed to change the 110-year-old name, says he will appeal against the decision. "If it had been the other way round, if the FA had approved it but the fans had said no, I would have severed my ties with the club immediately," Allam, who took charge of the club in in December 2010, told BBC Sport. "But the results mean I owe it to the silent majority to appeal and to fight on. "For now what is important is what happens on the field. We want to finish as high as we possibly can in the league, and the FA Cup gives us the possibility of getting into Europe." However, there is no appeal process with the FA and the Council decision is final. Hull can resubmit next season if they want to. Any appeal would likely have to proceed through the Court for Arbitration for Sport (Cas). Allam believes the 'Tigers' name would make the club more marketable, and says he considers the word City to be "lousy" and "common". On Monday, City season card holders had narrowly voted in favour of the name-change plan. But responding to the FA Council decision, City Till We Die said: "We are very pleased that the FA has recognised the importance of the historic name of Hull City AFC to the fans and the wider community of Hull. "This is truly a victory for the fans." Supporters Direct also "welcomed" the decision, but added: "The FA must create a democratic, transparent process for consultation in matters such as these, and one that ensures that supporters have the final say on such matters through a binding vote." Egypt-born businessman Allam announced in August that the name of the business that runs the club had been changed to Hull City Tigers. In December, the club applied to the FA to change its playing name to Hull Tigers from next season. Allam, who moved to Hull in 1968, is credited with rescuing the club from administration, with his son Ehab, City's vice-chairman, saying this month that his family had put £74m into the club. Last season, Allam oversaw promotion to the top flight for only the second time in the club's history. They are currently 12th in the Premier League and will reach their first ever FA Cup final if they beat League One side Sheffield United on Sunday - their first semi-final since 1930. The team's "Tigers" nickname is thought to have been coined by a Hull Daily Mail reporter in 1905, in reference to the club's black and amber kit. The FA Council is made up of representatives from across football and has been given the power to regulate football issues such as disciplinary matters, referees and match and competition sanctioning.